Every Tuesday I post an image of a texture or the use of a texture (digitally added) and invite you to join in the fun of sharing a detail of your part of the world by linking your own post to my current one and posting the link to your post on the comments of mine. Tuesdays of Textures is meant to be a fun way to explore textures through photography and share with others; any image quality or size is welcome and there is no specific theme. If you capture a texture, share it! You don’t have to make an exclusive Tuesdays of Texture post, so you can also merge challenges. You can find an image during the week and join any day. You can also @naramilee in twitter or instagram to share images from both platforms. 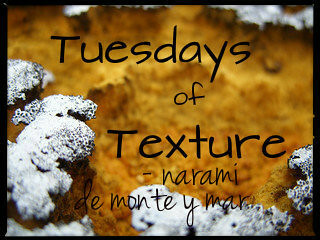 You can hashtag them #TuesdaysOfTexture so we can all find the participations better. Hope to see your part of the world! Nice challenge. I found you through Yvette Prior. Hi Marsha! Glad you like it! If you want to share a post, link it in the comments and I’ll check it out 🙂 have a great week ! Thanks! A fun chance to go through some old photos! But no worries, I got it from twitter 🙂 thanks for sharing!